1) Donuts should be............Covered with chocolate and filled with raspberry filling, or cream. 2) Even if you would rather gouge your eyes out than watch sport.... which sport do you most enjoy/least despise watching on TV? When I watch tv, I enjoy watching boxing/cage fighting most, but, I'll watch the occasional NASCAR race, or, less frequently, football. I kinda like American Ninja Warrior. 3) What was your favorite dressing up costume as a child? I was a vampire several years. Momdigr made me a red-lined cape and urrthang. I still have a 1973 Scooby Doo costume, plastic outfit/mask. I have the original box, too. 4) Favorite green vegetable? Bell peppers, or peas, it's a close call. 5) fish or snails? Fish. Wtf, woman? 6) Jeans -love 'em or hate 'em? Love 'em. In winter. 7) What kinds of things do you buy second-hand/used? Almost anything but clothes and food. 8) When was the last time you got your eyes tested? The first time I got my driver's license. At 16. So 35 yrs ago. 9) Do you like chocolate milk? Yes ma'am, yes I do. 10) What is your preferred writing implement? Pen, medium point, black, w/pocket clip. Last edited by Gravdigr; 10-07-2018 at 10:12 PM. … 4) Favorite green vegetable? Bell peppers, or peas, it's a close call. It's a trick question. Bell peppers are considered vegetables in culinary contexts; but, botanically speaking, they are fruits. 8) When was the last time you got your eyes tested? 11 months ago, thanks for reminding me to make an appointment! 10) What is your preferred writing implement? The UniBall "Signo" is the best line of gel pens. They make a .28mm version, which I thought would be too fine for me, but it's such a good pen and I go ahead and write smaller letters with it, and it's nice. It's really made for the Japanese market, where their detailed characters require very fine writing. 2) Even if you would rather gouge your eyes out than watch sport.... which sport do you most enjoy/least despise watching on TV? Football! 1) Donuts should be fresh. 3) What was your favorite dressing up costume as a child? Did not have. 9) Do you like chocolate milk? Yes. This endorsement brought to you by America's dairymen except those evil guys in Ontario whose tariffs made dairying profitable on one side of the border. 2) Even if you would rather gouge your eyes out than watch sport.... which sport do you most enjoy/least despise watching on TV?American Ninja Warrior is the most entertaining sport on TV right now. I could watch it for hours, and have. 3) What was your favorite dressing up costume as a child?Jolly Green Giant, although I was in college. I made a tunic out of branches I cut off the bushes around my dorm, and painted my skin green with water color. 5) fish or snails?As food? Fish. But if we are talking about smuggling contraband, I'd rather smuggle snails. 6) Jeans -love 'em or hate 'em?I realized a decade ago that jeans are not comfortable and perform poorly overall. I don't get their appeal, and even I used to love them. 7) What kinds of things do you buy second-hand/used?Tools, cars, clothes, camping equipment like my Coleman stove, bikes, but mostly tools. A lot of tools. 8) When was the last time you got your eyes tested?In the spring? 9) Do you like chocolate milk?I wanna say yes, but I never drink it, so I must not care for it. 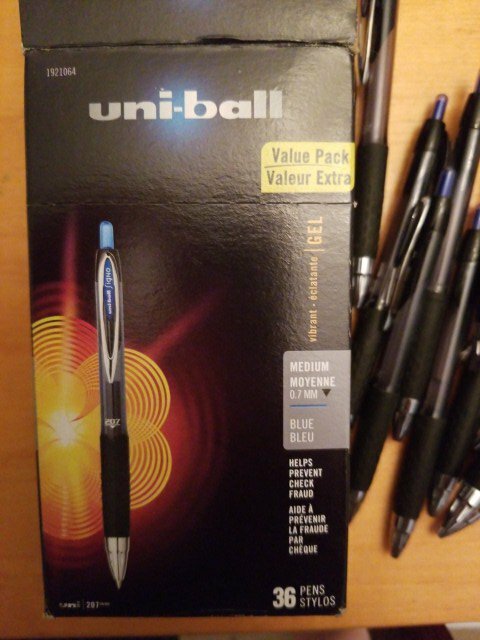 10) What is your preferred writing implement?uni-ball deluxe fine, with super ink, whatever that is. Peas, on the other hand, are botanically a legume. Yeah well, m'grocery store don't have a legume aisle. They do have a vegetable aisle, though. Please don't tell us how you would do it. Legume is French for vegetable. With French cuisine you're good to go. Clothes, shoes, furniture, dishes, electronics, appliances, tools, camping / sporting gear, toys (LEGO especially), miscellaneous hardware / electronic components, any kind of durable good that could be re-used / re-purposed. I've collected enough stereo components to have audiophile systems in my home, garage, workshop, car, and shelves full of spare parts. When I wear fancy slacks and ties and shiny shoes to the office, it is all used. Nice v-neck sweaters, cardigans. Scrubs. Basically the only things I buy new are food. MUSICAL EQUIPMENT. Drums. A whole workshop full. A 1970s Ludwig Vistalite bass drum for $20 is one of my best purchases ever.